This book arrived in spring 2010, and from the moment I saw it I knew I had to read and review it. A decade ago I was Diane’s research assistant and she served on my dissertation committee. I learned much from her, and I long have admired her intellect and intensity, and that she made it to the top her own way. Before I could get writing, a media-political storm hit, and I ended up sitting back and watching the tempest tear. I have listened to the wild-eyed supporters and the growling detractors, and now I feel it is time to have my say. But the book did not become a big-seller by offending everyone. Liberals, anti-testing advocates, teachers, and everyone who feels besieged by the recent accountability policies will be tickled by this book. Diane deserves credit for calling out the education reform movement for over-promising and slipping into denial when things do not go as they dreamed. One big downside of the recent accountability movement is it has produced heaps of data that politicos and anyone with a skin in the education game can cite. Journalists, sadly, often repeat these data to the public without studying what they mean. And school, choice, well it has had its successes but it is no miracle cure. In certain areas, say very rural ones, it is unworkable—there are not enough children to create a market for education providers. For all the controversy over Ravitch’s book, ultimately what she wants is probably what most other education policy people and parents want. She wants schools with a liberal arts curriculum that is broad and deep and staffed by learned, skilled teachers. She wants schools that are safe and orderly and teach children “good behavior, good citizenship, and the habits of mind that promote thoughtfulness and learning.” Who could object? But I have a few beefs with The Death and Life of the Great American School System. For one, she does not give readers, let alone policymakers, much of a road map for moving forward. She argues briefly for (1) a national curriculum; (2) better measures of educational achievement including state inspection teams who would visit schools and assess teacher performance; (3) well-educated teachers with deep content knowledge; (4) better compensation for teachers “that reflects the community’s respect for them as professionals”; and (5) social programs to help improve parenting and families economic well-being. As for what steps should be taken to achieve these policies, well, the book does not say much. The push for a national curriculum has been on since 1990 or so—-to no avail. Similarly, the often content-light training many teachers get in education schools has been commented upon since at least the 1950s; yet little has changed. The Great Society and successor social programs tried to provide holistic support to poor children and their families but crashed and burned. Regarding teacher compensation—I am not sure why she finds it inadequate. She offers no data or analysis. I agree their salaries are not superb, but their benefits and job security are second to none. Additionally, I do not share Diane’s assessment that accountability and school choice are doing more harm than good. I think different policies have had different effects in different places. Furthermore, it must be said that these school reforms have only been tried sporadically over the past 20 years, and they often have been implemented poorly. So I do not think one can comdemn them wholesale. Should NCLB be reworked? Of course. Years ago I warned about its problems and argued that NCLB was an imperfect amalgam of more money, free marketism, and standards and testing policy. That is politics for you, and when the law is reauthorized some of the shoddy portions will be taken out. Rather than damn accountability and choice, why not refine them and get them right? A century ago airplanes and automobiles were undependable, dangerous, and egregiously expensive. Thankfully, we did not declare them unworkable and double-down on railroads and horse-drawn buggies. And this brings me to the matter of school choice. Ravitch admits that prior to being appointed by President George H.W. Bush to the Department of Education, the “issue of choice had never been important to me.” She stumped for it for some years; now, she appears to see little good in it. To be clear—she does not favor policies to prevent parents who have the wealth from choosing a private school. But, otherwise she sees little good in choice and mostly harm. Charter schools, she says again and again, take the motivated kids out of bad schools and leave the unmotivated ones behind. (Surprisingly, she lauds the Catholic schools record of educating poor city children. Why are they not condemned for “cream-skimming” the good kids from the public schools?) Now, one can debate whether this is really occurring wherever charter schools exist, but let me take two other lines of argument. First, realizing good kids are often turned bad by troubled kids, is there not some good in freeing these kids from corrupt school environments? Why risk their futures in a gamble for the others? Second, there is the “different kids” argument for choice. In short, kids learn differently. Anyone who has two or more children likely will attest to this. Why should differently-abled and differently-disposed kids be shunted into the same school? How, say, is it good or fair to require a non-wealthy family to send their sensitive, artsy son to a public school with a reputation for being athletics-focused? Different children will flourish in different schools, and to insist that each neighborhood public school be everything to every child is to demand something that never has been and never will be. All that said, I should be clear—I am glad I read the book. 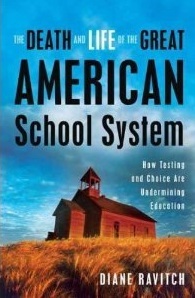 It was provocative and made me think harder about education policy and the future of schooling. Kevin R. Kosar edits the Federal Education Policy History website. He is the author of Ronald Reagan and Education Policy (2011) and Failing Grades: The Federal Politics of Education.